18 months. Wow. It sounds cliche but that time went way too quickly. I thought I would show you some of the toys and materials I have out for Sarah at 18 months. These are in both the playroom and her room. This toy rotation was a bit of a sad point for me. I realised that I was putting away all the baby toys for the last time. Hopefully there will be some new babies in our extended family soon that I can pass them on to. 1: Farm animals and small people – Sarah, interestingly, has started to pretend play. Still on a very elementary level, but imagine none the less. These little people repeatedly say ‘hello’ to each other, they walk together and talk with the animals. 2: Train set with a few track pieces – Sarah enjoys connecting and disconnecting the carriages. Recently I added a few pieces of track for her to manipulate. Not too many to be overwhelming, but a few for her to connect and drive the trains back and forth. She is content with this small amount of track at the moment. Once she has mastered connecting the pieces I will show her how to make a circle. 3: Balancing moon – I bought this balancing moon from Smiling Tree Toys on Etsy. It’s a little challenging for her but not so much that it is frustrating. At the moment Sarah is able to balance three or four pieces. Jack (3.5yrs) really enjoys this toy too so I can see it being around for a while yet. 4: Wooden stacker – We bought this stacker for Sarah’s 1st birthday from Little Sapling Toys on Etsy. It has been on her shelf this whole time. Mostly Sarah will place the pieces randomly but she is starting to see the differences in size and stack them in order. 5: Wand magnet – Sarah has been completely captivated by this wand magnet all this week. I did have more non-magnetic items in the basket but this was a little frustrating for her (I don’t think she yet understands the concept) so I took most of them out. The little balls in the bag are also magnetic. Sarah will wave the wand over the magnetic balls and watch them move, all whilst smiling to herself. 6: Jegro – I wasn’t able to find a link for these blocks. They are basically wooden stacking blocks for pattern work. I have had them for a while. They come with pattern cards although I just have the blocks out for Sarah. She likes to stack them up and up and up. 7: Eggs and cups – These are a very simple toy that Sarah likes to play with during quiet time. She can sort the colours if I have just two eggs out but mostly she likes to play with them all together. 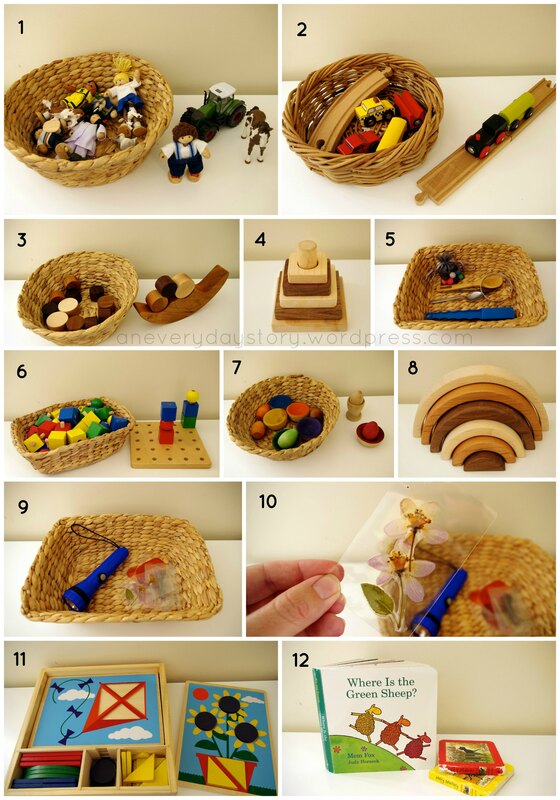 8: Wooden rainbow – This would have to be my favourite of all Sarah’s toys. It takes a lot of concentration to stack this rainbow. Sarah prefers to stack the pieces rather than form the rainbow. She needs to balance the pieces and so it is a little challenging. Jack really enjoys this toy too. 9/10: Nature’s tiny treasures – I made these little cards for Sarah recently and she has really enjoyed exploring them. They are simply tiny little natural treasures, (like petals, small flowers, feathers) that we have collected on our bush walks. They were getting lost amongst the other things on the nature table and so I laminated them in some ID sized pouches. The heat from the laminator made the petals somewhat transparent so I added a torch to the basket for Sarah to use. She is able to turn it on and off so she is really enjoying this basket at the moment. 11: Beginner Pattern Blocks – These are from Melissa & Doug. Jack was much older (over 2yrs) when he started playing with these simple puzzles but I pulled them out to see if Sarah was ready for them. With a bit of sliding around she is able to get the correct shape into the hole. She still has a lot of mastering before she outgrows these puzzles. 12: Books! – Sarah’s language has exploded recently. I remember this happening with Jack. Suddenly she only needs to hear a word once before she can say it. Now she wants to know what everything is. She brings me book after book, not to read the story, but to name everything on each page. These books are her favourite at the moment; note how loved Slinky Malinki is. So this is what Sarah has on her shelves as well as in the playroom at the moment. While she spends a lot of time playing with her things, what she really loves at the moment is, practising over and over, practical life activities, like putting on her shoes, combing her hair and helping out in the garden. But I think that’s for another post. Where do you find all those lovely baskets? In the US i can’t manage to find any quality baskets that don’t break the bank. I just love the tiny nature treasure cards? What a great idea, definitely will make some too! Lori, I have found that garage-yard sales are a great way to find baskets without breaking the bank! They’re really sweet aren’t they? I’m finding myself looking for little treasures now so I can make some more. They look really great on the light panel too. Hi Kate, can’t wait to have your post about putting on shoes with Sarah. My son at 14 months really likes to try putting on his shoes too!